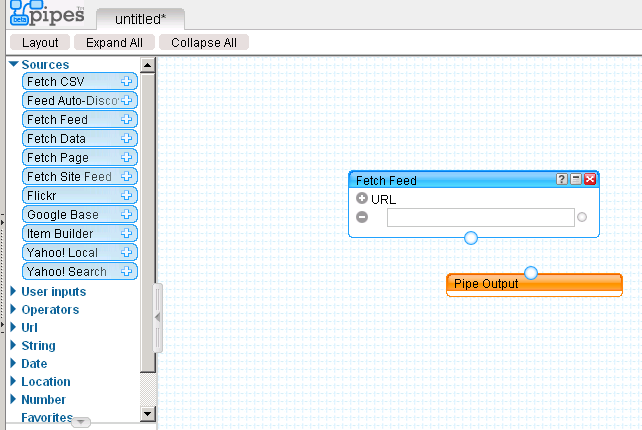 Today is a good day; I have successfully built a working Yahoo Pipe. It’s not especially pretty but it is, I think, quite clever; it filters all the latest news, photos and quality blog posts from the world of Fashion for the Girls Behaving Stylishly team to place on their blog as a widget, and to help them spot trends quickly without having to trawl the web. Building a pipe is nowhere near as complicated as it looks and as an information-sharing tool for journalists it has myriad possibilities. The reason I finally got around to building a pipe was that I spent a day on a training course run by Paul Bradshaw, whose post on building Yahoo Pipes mashups is here. Paul walked the class through every step of building a pipe and successfully de-mystified the whole process to such an extent that, in addition to the Liverpool FC pipe I created in class, I logged at home and created the fashion one. 6. Next step: Find some fashionista-type blogs. I went to Technorati.com and searched for ‘fashion’. It found me some fashion blogs but also threw up related tags including one for ‘fashion experts’ which seemed promising; clicking that link took me to host of blogs by fashion experts. 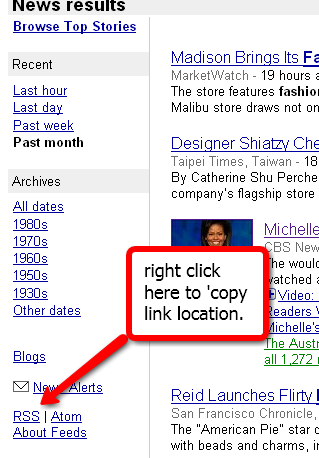 I right-clicked on Subscribe and copied the url to the Pipe feed as before. 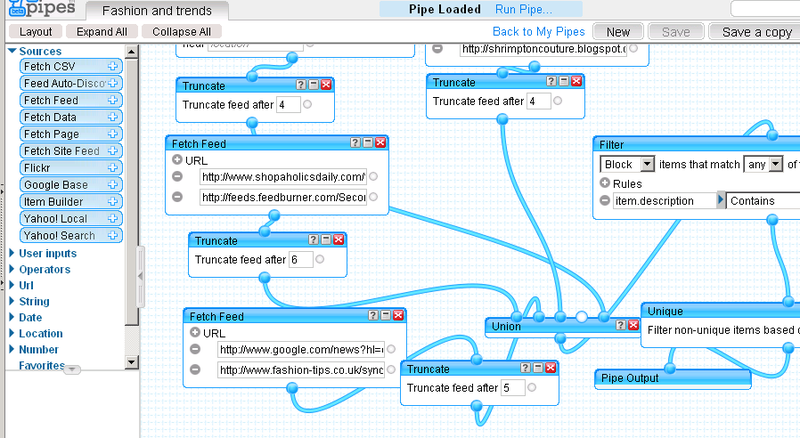 Then I added a Flickr feed from the Pipes menu and a ‘Union’ from the ‘Operators’ section on the left, to link all my pipes into one. Finally, I took a ‘Filter’ and a ‘Unique’ from ‘Operators’ to screen out sweary and/or duplicate posts, and added a ‘truncate’ option to the fashion pipe so I only get the latest updates. The next step is to make a widget for the pipe using Widgetbox.com (I’m thinking leopard print for the background). Of course, the easiest thing is to share the knowledge so the rest of the team can build their own Yahoo Pipe and put it a Reader to easily follow breaking news and events in the areas they cover. 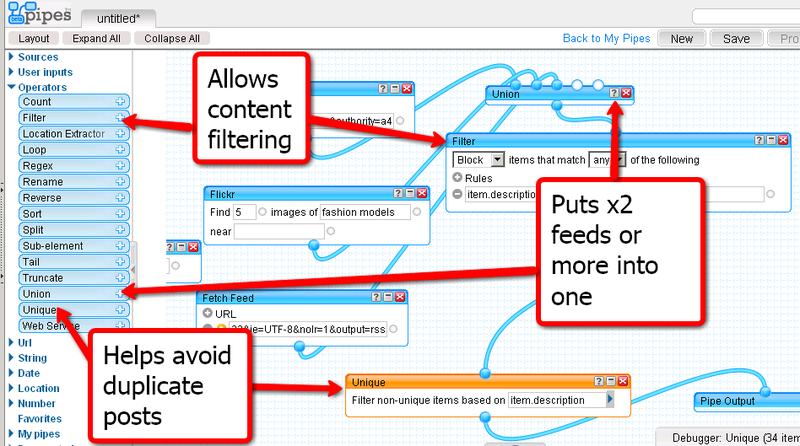 So, Yahoo Pipes may look forbidding but it’s definitely worth having exploring; it is much, much easier than it looks. Hi Sam, that’s a great idea – you could build a pipe to track wedding related blogs, news posts, forums etc and have them display on your blog. Good luck and do let me know if you hit a problem following the guide – I’ll update it from your feedback.